Sydney Shop Girl: The Weeknight Book Club: The Secret Holocaust Diaires by Nonna Bannister. 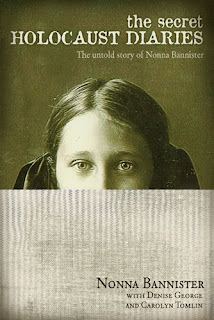 The Weeknight Book Club: The Secret Holocaust Diaires by Nonna Bannister. It would be impossible for most people not to compare 'The Secret Holocaust Diaries' to 'The Diary Of Anne Frank'. They are both powerful memoirs of a shameful period of our history that we should never allow to go out of print (or to be lost in the data cloud) in the hope that we never allow such atrocities to be repeated. However, Anne Frank did not live to experience freedom and peace after her journal ended. Nonna Bannister not only lived, she thrived and built an entirely new world for herself in the United States, where she lived until she died in 2004. Nonna kept the existence of her journal a secret to her family until rather late in her life. Her family often remembered seeing her retreat to a particular area of the attic for a few hours at a time but they never realized the significance of what she was doing amongst the relics of the past. It turns out that Nonna was editing the original writings she had managed to bring with her from Russia and then the concentration camp in Germany to the United States. The original diaries were held together by a hand stitched fabric cover and a photograph of this is included on the cover of the book. Nonna's later re-workings were on yellow legal pads. She painstakingly translated her early writings from the numerous languages she knew into English. It was this skill with languages and writing that probably saved her life during the war. Nonna was born into a wealthy and educated family in Russia. Her parents encouraged both Nonna and her brother to read and learn as well as to treasure their family and the love they all showed for each other. But the world was changing around them. Into an ugly place which encouraged children to spy on parents, neighbours to 'inform' on neighbours. Material possessions were being taken from hard working families to fund dubious causes that were unlikely to benefit anyone beyond the inner circle of the army. There was physical suffering and deprivation but somehow, Nonna's family kept the magic of life glowing for as long as they could. Then the ethnic cleansing and slave labour that were nothing but whispered comments to Nonna, started to become her reality. She suffered the trauma of having her severely beaten father 'returned' to their now meagre family home and could do nothing beyond sit with him in his final painful hours. Nonna was only a child at this time. Then, Nonna and her mother were sent to a camp which they managed to survive. Nonna lost contact with her brother and until her death, never knew his fate. After the horrors of the camp, Nonna and her mother are 'rescued' by some nuns who take the pair in at a hospital where they work and have access to the most humane living conditions in their recent memories. The existence of this book is a miracle in itself, a triumph of the human spirit and its resilience. That Nonna could not only survive the war but to be able to heal herself through determination and faith so that she could relive the past and use these memories for a higher purpose. That she was not broken by all the pain and loss around her for so many of her formative years. For me, the most haunting aspect of this work wasn't the period of history that it described but rather the innocent voice that captured it all. The same intelligent little girl who wrote of a Christmas sleigh ride and a walk in the sun with her mother also had to write about watching a Jewish baby being killed in front of her and later the dogs set upon fellow inmates at a camp. The eyes that saw flowers also saw the pale and cachetic living ghosts of human beings through barbed wire fences. You may not sleep easily after finishing 'The Secret Holocaust Diaries' but you will reach out to touch the arm of someone close to you and tell them how happy you are that they and you are sharing a moment together. What can I say - this sounds like one of those books that you really should read because it can potentially alter the way you see some things in life. Thanks for sharing! This looks like a great book and I'm going to order it from Amazon. If you haven't read "Journey into the Whirlwind" and "Within the Whirlwind" Eugenia Ginzburg's memoir of surviving the gulag, I recommend them.